American Insure-All® has your RV Insurance in Burlington. It is certainly something to consider before heading out on the road. Autumn is a great time to think about following the sun – especially if your normal residence is in the northern U.S. or Canada. “RV” stands for recreational vehicle, a term that can cover a considerable amount of territory in describing vehicles that can be owned by ordinary citizens. These range from the classic motorized house-on-wheels down to the little pop-up camping trailer that can be pulled behind a standard pick-up truck. RV can even describe the four-wheel-drive vehicles that are designed primarily to pull your home-away-from-home. RVs include “toy haulers”, which are a trailer with space in the back for four-wheelers and similar vehicles, over-the-cab campers, bus-style homes on wheels that are powered by diesel or regular gas, and even the old-style travel-trailer. No matter what kind of RV you own, be sure to refresh your insurance policy before you head out on your autumnal adventures. 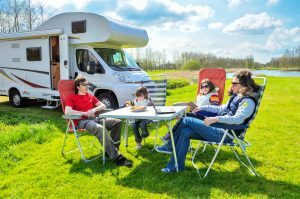 Whether you are a retiree enjoying freedom from a daily job and a family, or a millennial celebrating the freedom of being self-employed through the Internet, your RV needs to be insured before it leaves the driveway. American Insure-All®, at 888-411-AUTO, can help you to select the RV Insurance in Burlington that fits your vehicle. In the words of the old Irish Blessing, “May the road rise up to meet you, may the wind always be at your back, may the sun shine always on your face…and may love dwell always in your heart.” And may you also have good vehicle insurance for those days in your travels that are not always quite so blessed. We are here to help, just call us. We’ll be waiting.